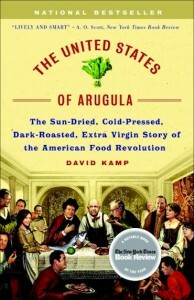 I needed a break from fantasy, so today’s review is non-fiction: The United States of Arugula: The Sun Dried, Cold Pressed, Dark Roasted, Extra Virgin Story of the American Food Revolution. I really love both food and history (see my reviews of Curry and Fannie’s Last Supper), so this book was a natural choice for me. In the last 40 years, the predominant food culture in America has become “gourmet”. Salsa and sushi have gone from unknown to ubiquitous, and local ingredients, specialty cooking tools and celebrity chefs have become routine. The United States of Arugula attempts to tell the story of how this happened. This book is a fairly fun read, although it meanders quite a bit. We start with the Big Three that popularised inventive cooking and dining – James Beard, Julia Child and Craig Claiborne, and go all the way to Emeril Lagasse’s restaurant empire. Kamp has certainly done his research, and the text is packed with all kinds of little asides and tidbits that make the events in the book come to life. Any revolution always begins with a few people, and it is always interesting to read about those people’s motivations and understand the movement itself in context. Kamp takes this a little too far, though and the book comes off as overly gossipy. Beard and Claiborne’s (among others) sexual preferences are exhumed in detail, and there’s a lot of focus on who did and didn’t get along. For instance, Graham Kerr, a contemporary of Julia Child who also had a popular cooking show, is introduced as “Everyone in the food world agreed on one person they could hate”, even though their hate of him had no bearing on any significant events. I wish that Kamp had instead devoted that space to the events he mentions omitting in his introduction. Another problem with this book is that it was really hard to follow. I usually read epic fantasy and have no trouble keeping hundreds of characters straight in my head, but Kamp introduces so many names that it detracts from the flow of the book. Many of the people mentioned by name are only mentioned once, which adds to the confusion (is this a person I’m supposed to know?) Adding to this is Kamp’s love of tangents, he does not stick to one person or one chronological period or even one story. Chapter 2 starts off with an introduction of Pierre Franey entering the US, but jumps quickly to Jacques Pépin’s childhood, and then to French cooks’ propensity for local foods, to an explanation of “classic French cooking”, to a biography of Antonin Carême and so on… and when the book got back to Franey’s story after he gets off the boat, I had a hard time remembering who he was. Aside from those two issues, the book was a great primer on recent food history in the United States. This entry was posted in Books, Reviews and tagged food, history, non-fiction by Kriti Godey. Bookmark the permalink.